Serge Nubret is a successful bodybuilder and actor from the 70s. And he was known for his unconventional approach to training. Back then there were basically 3 groups of training philosophies in bodybuilding. There were some bodybuilder that built their physiques by a low-volume high-intensity high-loads approach like Mike Mentzer and Boyer Coe. Then there were bodybuilders like Arnold Schwarzenegger and Tom Platz which used to rotate and mix a variety of approach from high-rep high-volume to low-rep high-load training. 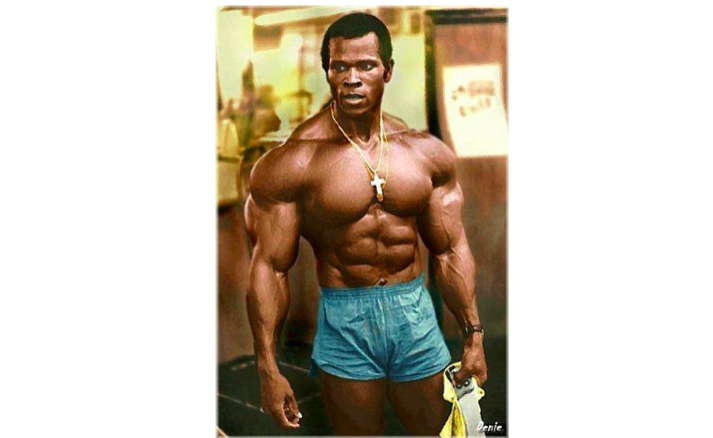 An then there was Serge Nubret who led the third type of training approach to bodybuilding in those golden days of Bodybuilding which was high-volume low-intensity approach. That means he would do up to 54 sets of 12 to 20 repetitions with 30 to 50% of his 1 RM per training. Bascially what he did is Strengthtraining-Cardio. Before going deeper into his approach one important factor to note when analyzing and applying his approach is his training foundation. Before he started bodybuilding he was a quite successful track athlete, sprinting 100m in 10,5 seconds, being known as a good shot-putter and bench pressing 225kg for reps at a bodyweight of about 85 kg. He was strong to begin is bodybuilding career. Which was a great base to succeed with the high-volume low-intensity approach he used. His main point was that lower weights lead to less injury risk. Yet, based on stories he would occasionally lift really heavy if someone doubts his strength. And second point thats the be made here is the importance of a metabolic stimulus for maximal muscular development. Its primarily Glycogen Supercompensation that will lead to sarcoplasmic hypertrophy which is a key driver in bodybuilding. With some workouts being over 1000 reps the metabolic stimulus of this training approach is tremendous and even exceeds Milos Sarcev’s highly effective giant set approach in total number of reps done per training. Serge Nubret didn’t start out training like that. And he also had at least one longer break from training every year due to his job as an actor. After these breaks for shooting a movie he would go a start at 3 sets per exercise again and the work up to the 6 to 8 sets per exercise that he would do in peak condition. Thats 18 to 24 sets per workout at the beginning, which is a quite average approach to training. And then instead of increasing the weight he would add sets to build volume backup by adding sets. Up to about 50 sets of 12 to 20 reps total per workout. He would train 6 days per week. Always two body parts per day. One for the upper body and one for the lower body. Most sets would not be to failure by leaving one or two reps in the tank. He took as much rest between the sets as he needed with workouts often taking up to three hours. The following program is an adapted version of what Serge Nubret originally did with a total number of sets and exercise as well as a double station – A1 A2 – approach and Upper, Lower, Arms & Shoulders Split to fit this approach into the most efficient training time of one hour and the recovery ability of most intermediate to advanced lifters. What Microperiodization system to use with this program? The only Microperiodization system that makes sense with this set-rep-scheme is to start with the heaviest set and then decrease the weight from set to set. I recommend 1 to 2 warmup set for the first two exercises of each program. Who is this Serge Nubret Volume Training Approach for? This is definitely not a beginner program. Even though the sets and reps look similar to what many beginners get once they sign up to a gym. A beginner will barely make any progress with this training approach. To do this approach and get results there are two primary prerequisites. First, one needs decent amount of strength and muscle mass. Serge Nubret could benchpress 225kg, yet he only used around 70 to 100kg for this amount of set and reps. So the absolute weights he used for this high-volume approach were fairly high, because of the high level of strength he had in relation. Doing benchpress with 40kg for these sets and reps will not give one the aspired results. You can see that in every gym all over the world. Second, one needs a high level of work capacity. This is important to not drop too much load during a training session due to fatigue. Most will experience a drop in performance at around 15 to 20 sets per session. That is an average work capacity. To maintain a high work rate at 50 sets per session one needs a high level of work capacity. Compare it with running, doing one kilometer at 15 km/h is not that hard, doing 42 kilometers at 15km/ is quite hard, as its a marathon time of about 2:45h. Same counts for training volume, it only makes sense to use high volume if one can handle high volume which means one can progress in training with high volume. How often can one do this program? If someone has the work capacity and strength to handle this program well, one can do this program 6 workouts in a row, which is a full 30 days based on the split shown above. How long someone does this program is determined by how long one can progress from workout to workout that means use more weight or do more reps in every exercise from workout to workout. Once one cannot increase total or average weight or the reps, its time to move on to the next program. This program is a great variation that I like for intermediate and advanced clients that have Body Comp goals and a work capacity that allows them to make progress from workout to workout. Its a also a good approach for a once in a while workout right before a longer break like a vacation or a carb feast. As the high volume will increase insulin sensitivity a lot which improves blood sugar management and glucose metabolism. To conclude an insight into Serge Nubret’s approach to training its with to also look at his food briefly. He was known have a fairly caribbean diet rich in meat, fish, vegetable, fruit and rice. He was known to eat up to 3kg of meat with rice and beans per day during his high volume training phases. He was a big believer in eating huge amounts of food to facilitate the recovery from this training approach. Which is definitely a critical point to consider for everyone trying this type of high-volume training. All the Best with Volume Training like Serge Nubret!